Step 1 Cut the cucumber and daikon in half lengthwise, and slice on the bias about one-eighth-inch thick. Place the daikon and cucumber into separate medium bowls. Step 2 Divide the salt, vinegar and sugar into each bowl and mix with the vegetables. Let sit for 5 minutes. Step 3Drain the vegetables, squeezing out excess moisture with your hands. Return them to their respective bowls. Add all of the Korean red chile to the daikon. Add the sesame oil to the cucumbers. The pickled vegetables will store for one week, refrigerated. In Recipes-list.com we have selected the most viewed recipes from category - Sauces and condiments Vegetarian . Enjoy the best recipes specially selected for you! 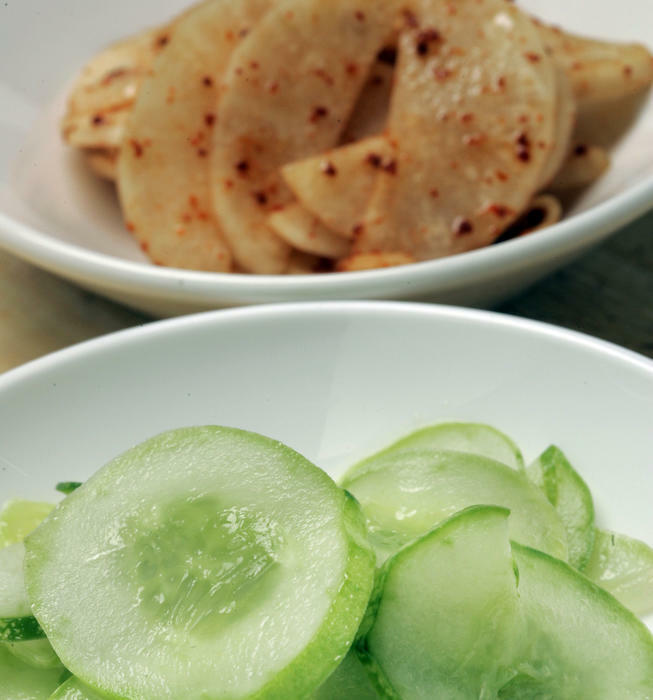 Quick-pickled daikon and cucumber is the right choice that will satisfy all your claims.